Create your own sterling 'Ice Sickle' & 'Water Fall' Ear Rings! SS-TUB-CREY Tube Crimp End Caps. 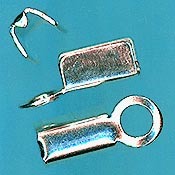 (crimped example shown at left) from our Pliers Page to permanently attach them. Safety spike at tube end. 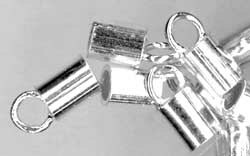 This is the classic old fashioned square braded cable used for decades to string heavy silver necklaces.